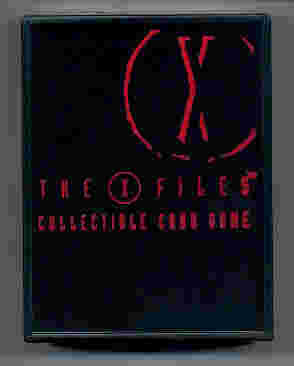 The Collectable Card Game was first issued in 1996. There are two version's v1 and v2, both of which comprise 354 cards, also 2 add-on sets, 15 promo cards and 5 ultra rare promos. The sets I have are the first issue XF96001v1 to XF960354v1. Then the Xpansion set XF970355v2 to XF970384v2. 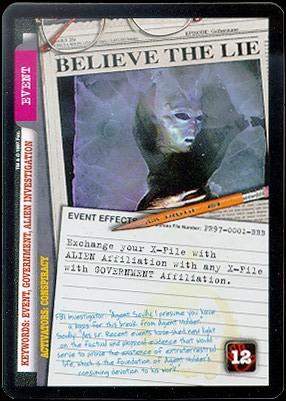 Then the 101361-expansion set, which is also known as Mulder's Birthday set, XF970385x1 to XF970509x1. All these cards are divided up into common, uncommon rare and ultra rare. This depends on how many of each card was printed and how many were put in the packs that can be brought. 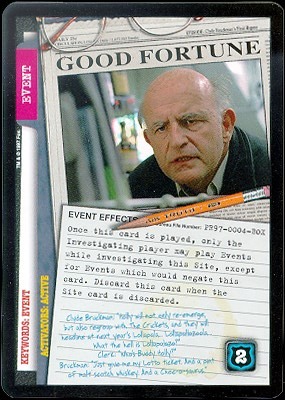 These are the CCG promos. 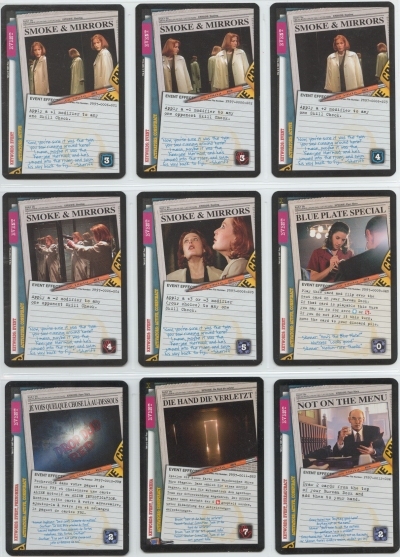 The second sheet has the 5 smoke and mirror cards and the 2 foreign cards. Click on the thumbnail for a better view. 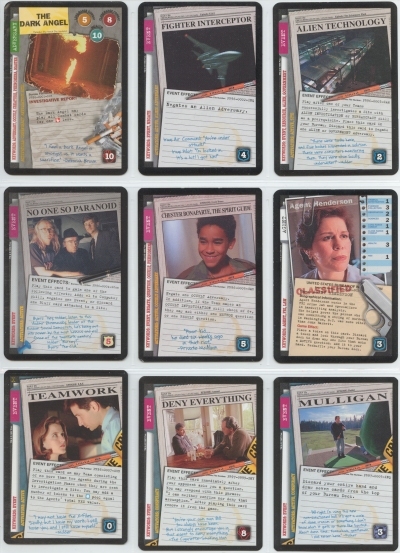 Click on the individual cards for a better view. I also have 2 foreign promos Je vous quelque chose la' au-dessous, a French one and Die hand die verletz a German one. The second set v2 is the same as v1 but the pictures have been slightly changed (but not by much). I only have the common and uncommon sets of v2. There are several ways to buy the cards: First you can get a 60 card starter set; second you buy 15 card booster sets the cards in these sets are all randomly packed so you could get anything from ultra rare to the 32nd repeat of the most common card. 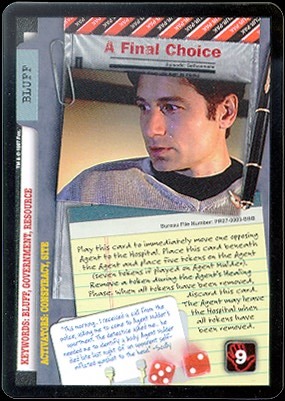 There are 2 different types of packaging, a brown and grey pack with half of Mulder's face and half of Scully's. 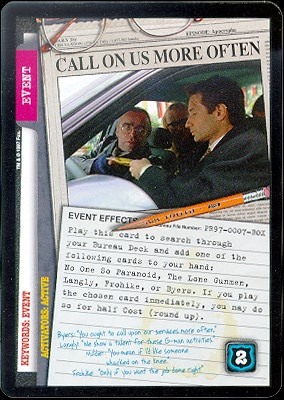 The 103161 set is in a grey/blue wrapper with a large X and just Mulder this time. Both the 60 card starter sets have the same artwork. There are 2 sets of rules for the game the basic rulebook in grey and the advanced rulebook in orange. 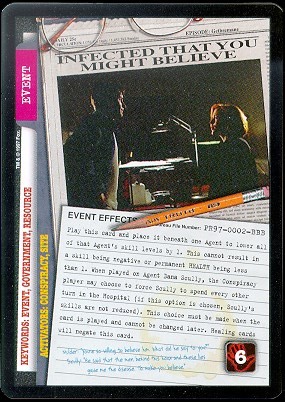 The cards are divided up into various kinds of cards or suits Combat, Site, Bluff, X-Files, Agents, Witness, Event, Equipment and Adversary. But as to how you actually play the game I don't have a clue and anyway no one is touching my cards with their hot sweaty fingers.